If you are looking for a proven effective way to better farm your neighborhoods, we encourage you to try ReaMark’s Just Listed & Just Sold Postcards for real estate agents. These postcards come in a choice of stock photos or can be fully customized with photos of a specific home or homes you are featuring. 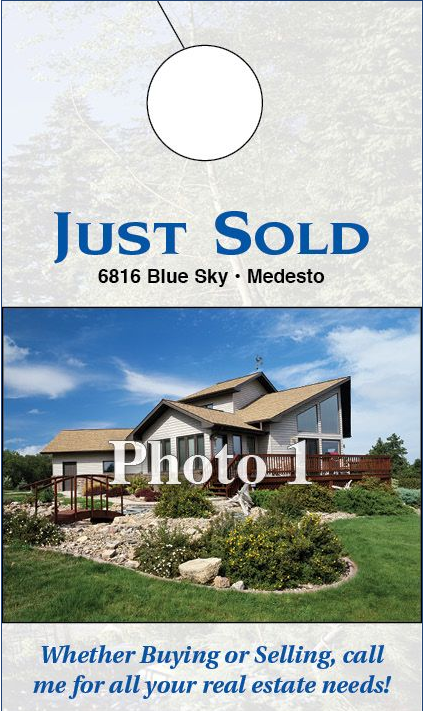 These attention getting Just Listed Postcards & Just Sold real estate postcards are powerful because they accomplish so many marketing missions in one mailing. These postcards help keep your name in front of prospects and position you as the area’s real estate expert. They show potential leads that the market is active and you are in the midst of that activity. Plus they provide interesting new data to prospects that they may not have been aware of. These postcards are designed to increase leads of homeowners who may have been considering selling previously and bring new prospects into the funnel. If a homeowner isn’t interested in listing their home, they may pass the information onto someone who is. This is a marketing tool of exceptional value! Our postcards come in regular or jumbo sizes and are available in a choice of designs. You can order them in small minimums and we offer quick turnarounds to get these in mailboxes quickly. 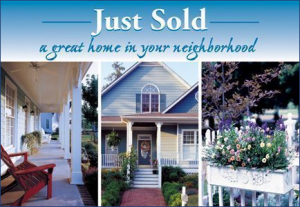 Ask about our buy 5 months, get one free month real estate marketing postcard offer. ReaMark can even make your marketing efforts easier with our full-range of turnkey mailing services. Our mailing services come with FREE data-base set-up and FREE frontside UV coating of mailed postcards. At ReaMark, we specialize in real estate marketing and promotional materials to help you grow your business. Our proven products have been used by successful real estate agents and brokers throughout the country. Many rely on our marketing experts and graphic designers for the assistance they need in implementing effective strategies. They are here to assist you! Get more leads by updating your target area with Just Listed Postcards & Just Sold Postcards from ReaMark. Put them to work for you and see how effective they can be. Order today and increase your prospects tomorrow! We are rapidly approaching peak of “real estate season” and there is still time to make the most of it with proven, real estate promotional products from ReaMark. We specialize in Realtor marketing and promotional materials that get results. Here are three attention-getting real estate marketing products to increase your leads and listings this spring. Our custom door hangers are an economical and effective way to farm your neighborhood. 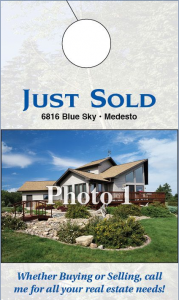 Our real estate door hangers come in full-color and are guaranteed to get noticed by prospects as they return home. Since they are fully customizable, they can carry your specific message. We also have stock door hangers that can ship exceptionally quickly and start as low as 12 cents each. Be sure to ask about our two sizes of door hanger bags to add additional “goodies” to hang on doors. You can save 20% right now when you order notepads from ReaMark. Real estate notepads can be customized with your name, logo and contact information. Spring is the terrific time for these notepads to help with spring cleaning “to do” lists. Choose from a selection of styles including full-color notepads, peel and stick your business card upon notepads or have your business card imprinted on a magnet with a notepad. Our magnet notepads are sure to find their way right on the refrigerator! Your information is visible with each use. Hurry and save 20% on your choice of real estate notepads this spring. What better way to add a burst of color to your neighborhood. Our seed packets come in a choice of four styles. The “Thank You” seed packet is a great way to says thanks to previous clients, or even to thank prospects for an initial meeting. Our “Where Memories Grow” seed packets are a wildflower seed mix and are a nice way to remind clients and prospects of your services. 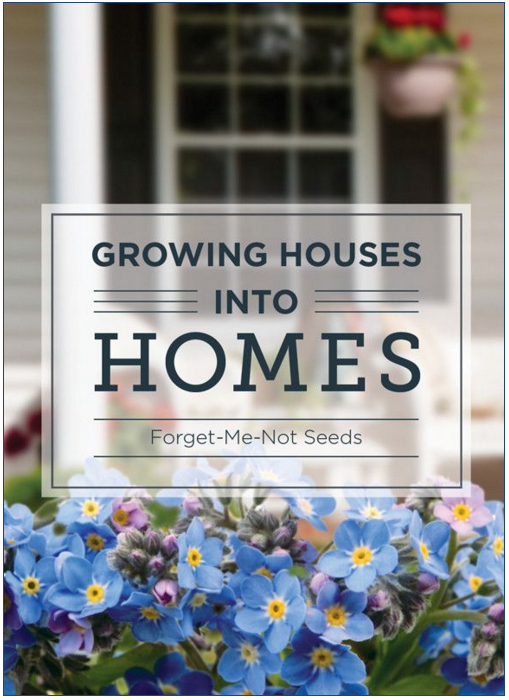 Forget-me-not seeds are placed in our “Where Memories Grow” seed packets and are a nice way to welcome spring. Our “Put Down Roots With Us” seed packets are proving to be a popular way to market to your farm. 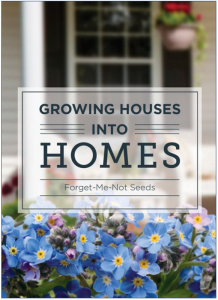 These are also a perfect promotional handout for open houses, home-shows or to handout at the corner coffee shop. Grow your business this spring with seed packets from ReaMark! Want more ideas? Browse our thousands of Realtor marketing and promotional products from calendars and real estate postcards to cookbooks and imprinted pens. We offer professional design services at no charge on most products. Energize your marketing efforts this spring with our wide-range of real estate promotional products from ReaMark.